The dial plate and the hands which move around on it to indicate the time are the most important parts of the "face" of a watch. They give it its function, and also its beauty. It is important to understand how dials were made because this affects how they can be cleaned or restored. It is also important to understand what type or style of hands go with what type of dial, so that the harmonious appearance of the two is preserved. Sometimes enamel dials are described as "porcelain", but this is wrong. Porcelain is made from clay and used for tableware such as plates. It is not suitable for watch dials. Dials are made with vitreous enamel, a type of glass. This is called "porcelain enamel" in the USA, which gets wrongly shortened to "porcelain". The very first watch dials were metal. In the eighteenth century the process of making white, cream, or sometimes black, dials using vitreous enamel, a glass coating on a copper plate, was developed. The word "enamel" simply means a coating, ‘vitreous’ means a ‘glass like’ appearance. Vitreous enamel dials usually have a glassy reflective surface, but they can be made matt by rubbing with abrasive after firing. Vitreous enamel is made from powdered glass. Tin oxide is added to make it opaque white, other chamicals are used for other colours. To make a dial the enamel is fused onto a copper plate by firing in an oven at high temperature, melting the glass and causing it to run together to produce a smooth glassy surface. First the white or black background is made, which might take four rounds of firing and smoothing to get the desired finish. Then the numbers and tracks are drawn on in black or white enamel ink, which is also fired, but at a lower temperature, to fix it to the white background. After firing an enamel dial is invulnerable to ageing or fading. Vitreous enamel dials will be cracked if they are flexed, e.g. by being clumsily removed or levered off from the movement, but apart from this kind of physical damage they will last forever. Vitreous enamelling produces a dial that will never fade and can be easily cleaned; they happily go through an ultrasonic clean. Enamel dials are expensive to make, so in the twentieth century cheaper materials were used, usually by printing onto a metal base. Such dials are prone to discolouration, fading, and spotting, but are extremely delicate and cannot be cleaned. Dial Cross Section (not to scale). The cross section here shows how an enamel dial is made. A sheet of copper is cut to the correct size and shape, with holes cut for the hand arbors, and "dial feet" attached to its underside. Dial feet are small copper rods soldered to the underside of the dial that enter holes in the movement bottom plate and are held there by screws. The copper dial plate is coated with crushed and finely powdered glass. It is then heated in a furnace to about 800°C until the enamel melts and becomes liquid, fusing together to form a smooth glassy surface and bonding to the copper. 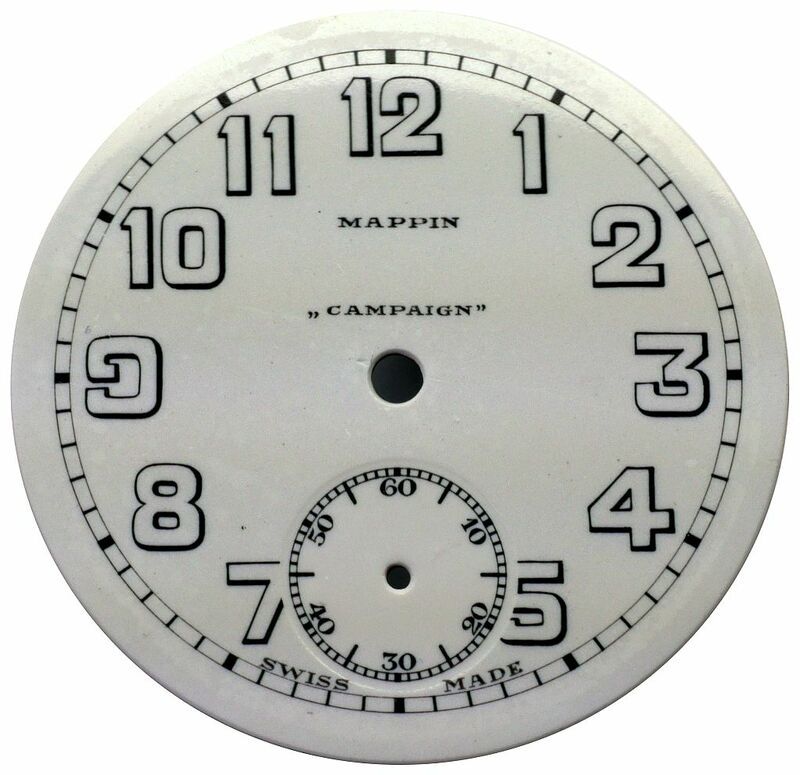 The numerals and minute and seconds tracks are then added in vitreous painting enamel, sometimes called vitreous ink, either hand painted or transferred with a stamp, and the dial is fired again. This melts the enamel of the numbers and other details and bonds them into to the base layer of enamel. In the cross section I have shown a white enamel dial with red ink on it, say a red number 12. When the enamel of the numbers and other details melts and bonds with the underlying enamel it becomes virtually flat with the dial surface as the cross section shows. The numbers and tracks become as much a part of the dial as the underlying enamel and cannot be removed. Initially the numbers and tracks were painted by hand, but later an engraved copper block was used. The engravings were filled with vitreous ink and a gelatine pad used to pick up the ink and stamp it onto the dial. In this way many dials could be made accurately and quickly. 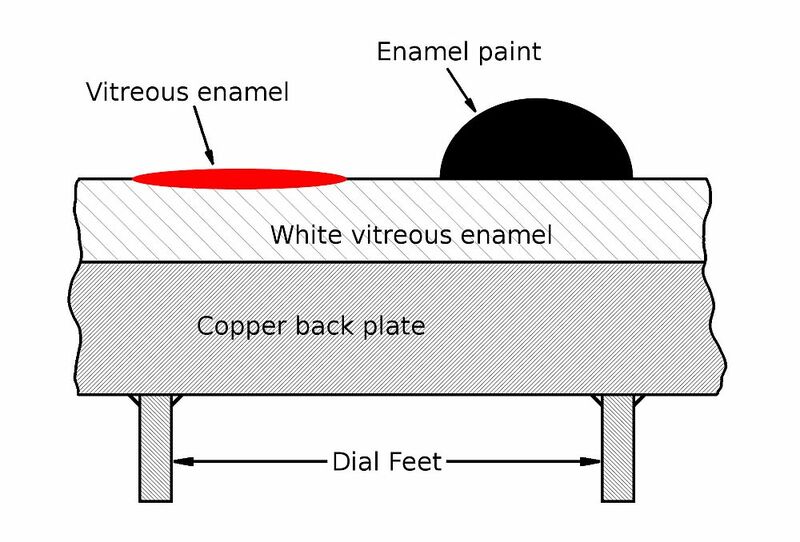 In the drawing I have also shown how names can be added to a vitreous enamel dial with "enamel paint". 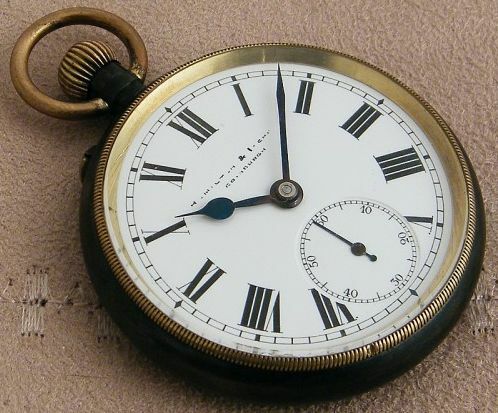 This is often done to watches that were imported into Britain before the 1930s, because until then British retailers did not buy watches with names on their dials. If there was to be any name on the dial, it was going to be that of the retailer themselves, so early Rolex, Longines, Omega, etc. didn't have a name on the dial, and sometimes no name anywhere. Nowadays most people expect to see a name on the dial, so some unscrupulous people have names painted on to make the watch more saleable (read "valuable"). It looks wrong. Enamel paint is a totally different material from vitreous enamel, it is called enamel because it forms a harder, glossier, surface than other paints such as oil paint. However, enamel paint is nothing like as durable as the vitreous enamel of the dial itself. Unlike vitreous enamel, enamel paint can be easily dissolved by a solvent such as acetone or isopropyl alcohol. Unlike the fired vitreous ink of the numerals and tracks, enamel paint doesn't bond into the underlying vitreous enamel but remains on its surface. It can usually be easily distinguished from the fired numbers and tracks by looking obliquely across the dial with a lens when it can be seen standing proud of the surface as illustrated. Because the vitreous enamel of the dial is very shiny, enamel paint has difficulty sticking to it and the added names have often become badly worn, or disappeared altogether. If you look carefully at a vitreous enamel dial and detect that a name has been added in enamel paint, but the name doesn't show any signs of ageing, chipping or flaking, then it is quite likely that the name has been added recently. Throughout the nineteenth and early twentieth centuries British retailers only allowed their own names onto the dial. The concept of a "brand" being applied to watches was unknown, and the names of foreign manufacturers were simply not allowed. This only changed in the mid 1920s when Hans Wilsdorf started to advertise the Rolex brand extensively in Britain, and people started asking for Rolex watches. Wilsdorf says that when the Rolex Oyster was launched in 1927 he made the decision that he would insist that all Rolex watches carried the brand name on the dial. British retailers were suddenly faced with customers who had read about Rolex watches in the newspapers, and seen adverts for them, and started asking for Rolex watches by name. The retailers had no choice; they had to start stocking watches with the manufacturer's name and brand on them, or their rivals would and they would lose out. This was the start of a trend and other watch manufacturers soon followed. Baume Advert 1911: Click to Enlarge. This generally meant that watches supplied to the British market before the late 1920s or 1930 had dials with no name on them at all, they were left blank so that the retailer's name could be painted on in enamel paint. The importer might have offered this as part of his service to the retailer, or the retailer may have arranged himself for his name to be painted onto the dial. The advert by Baume & Co. from the Horological Journal of 1911 reproduced here is evidence of this practice. Longines watches were very highly regarded by the watch and jewellery trade in Britain, and took numerous top places in observatory competitions. But the advert says that they are supplied “without any distinctive name or mark except that of the retailer”. This is not something that Baume or Longines wanted to do. If the Longines name were put prominently onto the watches, British retailers would simply refuse to order them. Baume and Longines were immensely proud of the quality of their watches, but they were also pragmatic; they needed to 'shift product' in order to make a sales and a profit. Given the intransigence of the British retailers, they made a virtue out of necessity and made it clear that they were willing, even if they were not happy about it, to supply watches without branding. If you have a watch dated earlier than 1930 and it has a Swiss manufacturer's name or logo on the dial, you need to be aware that this might have been added later, even quite recently, by someone trying to give the value of the watch a boost. This deception is most often found with early Rolex Watch Company items, where "Rolex" is painted onto the dials of not only actual early Rolex watches, but also the dials of Rolex's other brands such as Marconi, Unicorn, and other watches that would never have been called Rolex watches by the Rolex Watch Co. I explain why Hans Wilsdorf created brands other than Rolex at Rolex's "Other Brands". Before I started to expose this practice, there were few lengths that the unscrupulous would not go to. I have even seen a Marvin wristwatch from 1915/16 with Rolex laser engraved in the case back and on the barrel bridge, and Rolex painted onto the dial. Needless to say, the watch had nothing to do with Rolex. The dial shown here is from a Longines wristwatch. This dial has been through an ultrasonic clean, which is interesting because the name words Mappin and „Campaign” have not been affected. This is because the words are vitreous enamel fired into the enamel of the dial, the same as the tracks and numerals, not painted on later with enamel paint as is usually the case with British retailer's names, and which don't survive a trip through the ultrasonic tank. This, together with the opening low quote mark „ which is not used in English, shows that the name was put on in Switzerland by the dial maker as the dial was being made. Longines told me that the requirement for this dial is recorded in their archives showing that the watch left the St Imier factory in 1916 with this branding on the dial — but note, not the name Longines or the Longines logo. Longines watches supplied to other countries at the time often, or perhaps always, had Longines fired onto the dial. From about the mid-1920s this began to be accepted in Britain. The earliest British imported Longines wristwatch that I have with a genuine Longines logo on the dial has London Assay Office import hallmarks in the case for 1928 to 1929. The Longines name is semi-circular around the top of the sub-seconds track. This of course still left the space between the 12 and the central hand boss available for a retailers name. How can you tell whether the name or logo was fired into the enamel, and is therefore original, or has been painted on later? Enamel paint is quite different from vitreous enamel and nothing like as durable. It is a solvent based paint applied cold with a brush, just like any other paint. Enamel paint does not stick well to glass, which is essentially what a vitreous enamel dial is made of. Names painted onto enamel dials 100 years ago have mostly flaked off partially or even completely in the intervening years. When a retailer's name was painted onto a dial in enamel paint, by now it has partly or almost completely worn away or flaked off over the years, whereas the rest of dial markings in fired vitreous enamel are still crisp and sharp. The image of a Borgel watch here shows exactly this. The watch is an IWC in a black oxisdised steel case that was imported by Stauffer & Co. in 1908 and supplied to Hamilton & Inches in Edinburgh who retailed it. The Hamilton & Inches name and Edinburgh can still just be made out, but the paint has mostly flaked off the otherwise pristine dial. This is an easy indication that the name was painted on after the watch was made. 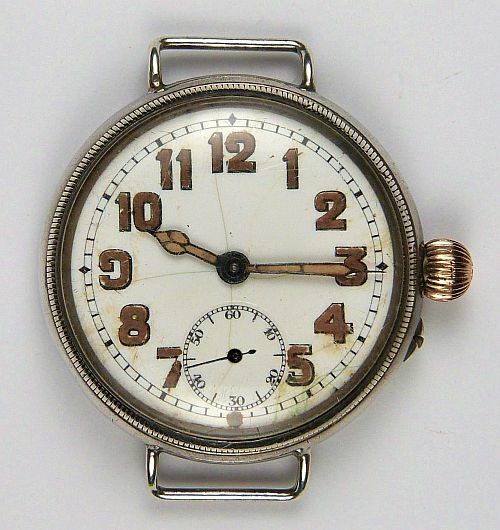 When you have looked at a lot of original early twentieth century watches without a manufacturer's name or brand on the dial, seeing one immediately looks wrong and not original. However, these days people like to see a brand name so sometimes well known names are added to the dials of watches in an attempt to boost their value. A name painted on recently using enamel paint can be difficult to identify, but there are several ways in which such an addition can be identified. If the writing looks crisp and sharp, it is not original. Original paint has partly or almost completely worn away or flaked off over the years. It is possible that original writing has been renewed, but witout a record of what the dial looked like before this was done it is impossible to know what was there originally, if there was anything at all. If the writing makes the watch more valuable by adding the name of a famous maker that is not found anywhere else on the watch, then it is often fake. Think carefully about getting radium paint on an early dial replaced with luminous paint. The old radium paint no longer glows in the dark, so if you replace it with luminous paint which does, it will be obvious what has been done. I think this is a good thing, it makes it obvious that the paint is a modern luminous compound and not the old, non glowing, radium based lume. The style of the hands should match the dial. In particular, if the numerals are skeletonised for luminous paint, the hands should also be skeletonised. The correct shape for the hands of a trench watch is shown in the image here. The shape of these hands was called in Swiss/French ‘poire squelette’ (pronounced ‘skelette’) i.e. pear skeleton, after the pear shaped bulge on the hour hand. They are often referred to as "cathedral" hands because they look a bit like a leaded and stained glass window. This style is referred to in manufacturers catalogues of the time as "Luminous" or often simply "Radium". Hands should also be the right length. The minute and seconds hands should terminate on their respective tracks, and the hour hand should point to or just touch the number. Copyright © David Boettcher 2006 - 2019 all rights reserved. This page updated October 2018. W3CMVS.